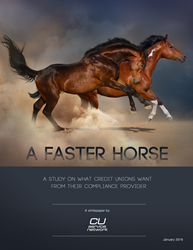 The whitepaper, titled "A Faster Horse: A study on what credit unions want from their compliance provider," explores the concerns and issues credit unions have with current compliance offerings. A must read for anyone involved in their credit union's compliance. Denver-based CUSO (Credit Union Service Organization) CU Service Network has published an in-depth whitepaper on what's lacking from credit union compliance services. The paper focuses on what credit unions actually want from a compliance provider, and the challenges they face in a increasingly burdensome regulatory industry. A must read for any credit union executive or compliance officer who is curious about the compliance services industry, and interested in a deeper analysis on what could be improved.